I hope you all had a wonderful weekend! We headed to Iowa to spend Easter with my family. Apparently we missed a little snow in KC, but that's okay with me. I would rather not see it this time of year! 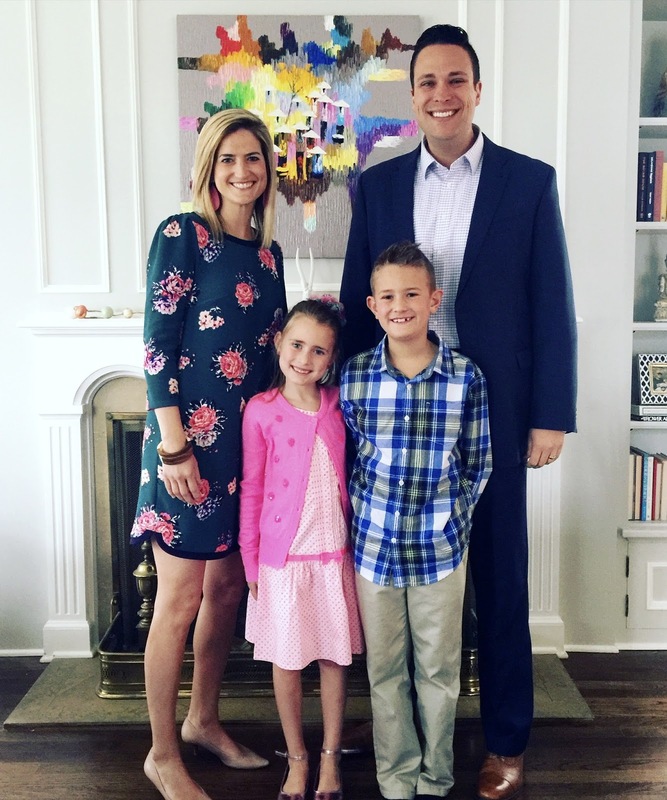 :) Here is our obligatory Easter family photo. Any time I can get Drew in a collared shirt and khakis, it's worth documenting! Spring has finally arrived in Kansas City! The first signs of green popping up in the yard makes this girl's heart happy! Warmer and longer days, working in the yard, and eating outside are all on their way! I've teamed up with Marty from A Stroll Thru Life, along with several other home, design, and DIY bloggers to share our spring homes with you! If you are stopping by from Remodelando la Casa, I'm so happy to have you here! Per usual, I don't do a ton of "decorating" for the seasons, but I do love to switch things up and add fresh flowers. Over the years, I have cleaned out all seasonal items that I thought I "should" put out, and now I only use what speaks to me and what I love. Our home lends itself to spring all year long because of my love for fresh greenery, plants, and the color pink! Now, let's get started! I made this DIY tulip wreath last year, and it's one of my favorite DIY's to date. The colors make me happy and looks great off of our black door. Come on inside! Hello! Happy March and happy spring! Things are greening up in KC and I couldn't be happier about that. We are headed out of town for Easter weekend, but we wanted to decorate eggs this week and I'm also using them in my spring home tour decor (see below)! Last year we dyed eggs with shaving cream and they turned out great. Messy, but great. 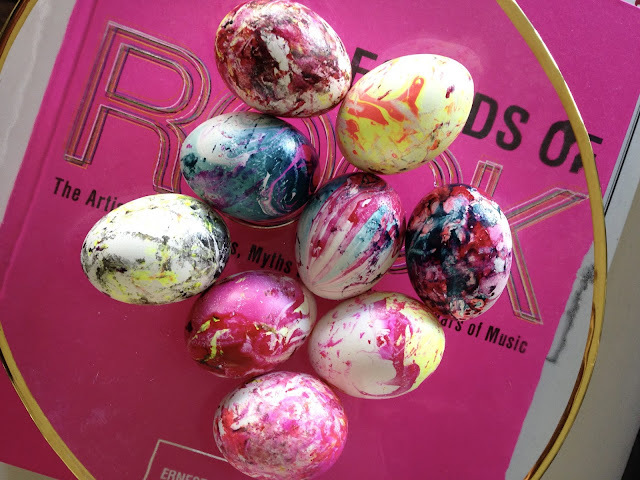 This year, we tried marbleizing eggs using nail polish and water. They turned out very cool! Almost graffiti-ish and very abstract, which I just love. This project is super simple and can be done in minutes.